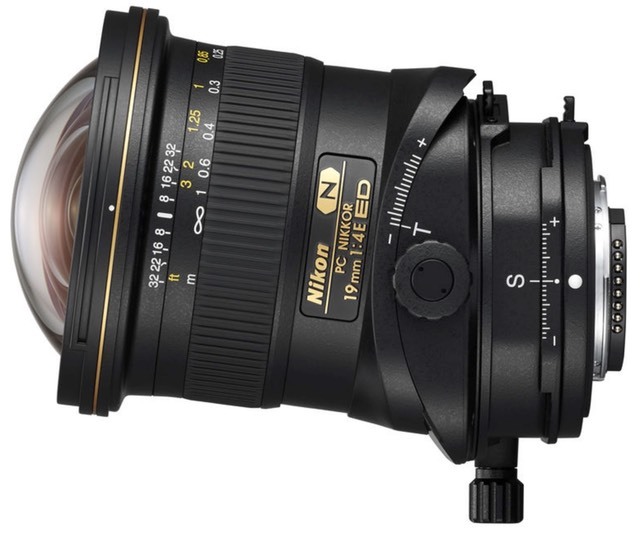 The 19mm f/4 PC-E is the most recent tilt-shift lens in Nikon's lineup, and the widest angle one. Unlike previous PC-E lenses, the 19mm can be tilted and shifted independently of axis, removing one of the major complaints of Nikon's previous tilt/shift lenses. Optically, this is a more complex lens than you might expect for a slow prime. We've got 17 elements in 13 groups, with 2 of those being aspherical and 3 being ED glass. Nano coating is used, and we've got a Flourine coating on the front element. The overall image circle is quite large, allowing a 12mm shift in any direction, even if tilted to the max (7.5 degrees, which is more than enough). As noted, the tilt/shift mechanism is now completely independent; you can tilt and shift in pretty much any combination you'd like. Moreover, the rotation mechanism has 30 degree click lock points. With shift, you get perspective control; with tilt you get focal plane control (Scheimpflug Principle). You're going to need to pay attention with some cameras when tilting and shifting, though. The lens was designed with full clearance for the D3 series, D4 series, D5, D500, D810/D810A, D850, plus the Z series cameras (the FTZ adapter puts the lens far forward where it won't hit anything on the mirrorless cameras). On the Df, D6xx series, D300 series, D700, D750, D800/D800E, D3xxx series, D5xxx series, and D7xxx series cameras there are certain tilt/shift combinations you can't get to because of the overhanging prism. Because this is an E-type lens, earlier DSLRs than the ones I've listed are incompatible. Despite the wide angle (97° diagonal across FX frame), this isn't a close focus lens. Nearest focus distance is almost a foot (0.25m), and the maximum magnification ratio works out to 1:5.6. There is a focus distance marking set at the front of the lens (0.9, 1, 1.25, 2, 3, and infinity for feet; 0.25, 0.3, 0.4, 0.6, 1, and infinity for meters), and DOF markings are given for f/8, f/16, f/22, and f/32, though they use the usual 0.33 CoC definition, which is a bit lax for me. Apertures range from f/4 to f/32, and are defined by a 9-blade diaphragm. The 19mm f/4 PC-E is a manual focus lens, like all the PC-E's. You really want to be using this lens with Live View on the DSLRs or with a Z6 or Z7 mirrorless camera. That's because the usual rangefinder focus help is not useful once you start tilting and shifting: you need to be able to see the focus plane clearly. That means that on some older DSLRs, this lens is going to be a bit difficult to tune right into focus. However, on the most recent DSLRs, such as the D850, and on the Z mirrorless cameras, I had no troubles at all evaluating focus on the Rear LCD (remember, you can magnify the image). To a large degree, this is a tripod-use lens. At least if you're trying to get everything out of it that is possible. Moreover, at almost two pounds (969g), it's a heavy lens, another reason why you're not likely to be wandering around with it shooting casually. The lens is made in Japan and retails for US$3400. You get a soft case with the lens. The new tilt/shift mechanism is what we've always wanted. Flexible, easy to adjust, good markings, and without any slop to the adjustments. There's a lock switch and tension adjuster, as well. Very nicely done. Likewise, the focus ring, which is up front on this lens, is very smooth, though the near-to-far twist is only about 90°, which is not as much precision as I would have liked. One thing I noted was that the cameras that have focus peaking really shine with this lens. Normally using the Scheimpflug Principle you can get yourself into all kinds of computational mud to figure out how the focus plane should be moved. I used to carry a small card with the 24mm PC-E so that I could remember a few of my "goto" tilts. With focus peaking, you can just see the focal plane shift. It takes some trial and error and practice to really dial in what you're doing, but getting to a good result is now much faster for me. Overall, this is by far the nicest handling of the Nikon PC-E's, and in working with it for awhile now, I've never found it's handling to be an issue. Some might object to the big curved piece of glass out front as it's very vulnerable, much like the 14-24mm. There's no hood for the lens, not even a built-in one (as it would impede some tilt/shift combinations). Curiously, the lens appears to have a bayonet-like mechanism at the front ring as if Nikon considered making a lens hood of some sort. Sharpness: Before I report on the 19mm, let me tell you about my experience with the 24mm PC-E: it was very good unshifted, but you could see it struggling in the edge of frame, especially as you started to get towards maximum shift. It also wasn't quite as good on the 45mp cameras as on the 36mp ones. In other words, the lens had a very wide image circle, but the sharpness was optimized to the middle of the central frame, and the higher-resolution cameras began to show the 24mm's limitations. The 19mm keeps its sharpness much better out into the overall image circle. That was just not expected. Don't get me wrong: the center definitely is sharper than the edges, but I still felt that the edges held up quite well, even out into the shifted area. So let me call the center excellent, the edges very good, and the shifted extreme good. Compared to the 20mm f/1.8G I had been using, the G's absolute center seems to be slightly better, but the G's corners aren't better. On top of that, the 19mm lens is very, very good at f/4, and excellent at f/5.6 (beyond that the high megapixel cameras I use the lens on start showing some diffraction impacts). To put this into perspective, consider the best 20mm wide angle lens you've used on a full frame camera. The edges of the 36mm wide FX frame are going to be a bit softer than the center on that lens, particularly wide open. On the 19mm, you have the equivalent of a 60mm wide frame (12mm shift each direction) and the edges are still holding up quite well. Plus the center of that wide frame is as sharp as you can get today at f/5.6. I've run both the tilt and shift in this image. 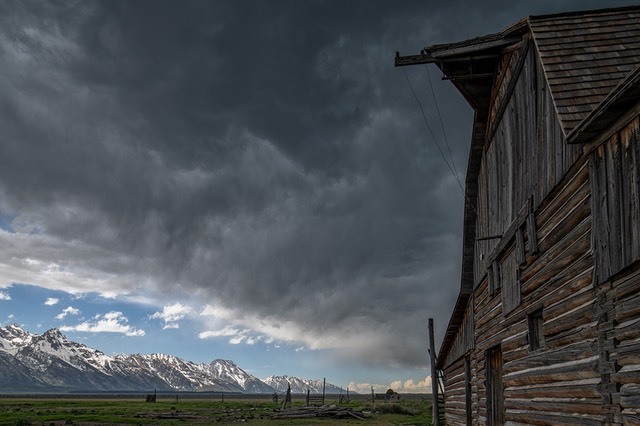 The shift to keep the verticals on the barn straight, the tilt to realign the focus plane so that I could keep both the barn and mountain range in focus. This was all done just using focus peaking in Live View (D850 image). Vignetting: I've moved vignetting up from my normal position, as it goes along with the sharpness comments: you can ignore it unshifted. There's no more than two-thirds of a stop worst case, and stopped down you're at about a half stop or less. Now, obviously, as you shift outwards, you should be seeing vignetting. You do, but this really only becomes clear and potentially needing correction at about 10mm of shift. Nikon just designed this lens with a huge image circle that is really well corrected. Chromatic aberration: The lens isn't fast enough to really generate significant longitudinal CA, though it does show some minimal lateral CA, particularly shifted near the edges in high contrast situations. On the 45mp cameras I found that I was doing a small bit of CA correction, but I didn't have any issues in correcting it. Linear distortion: We'd normally expect barrel distortion in a wide angle lens, and the 19mm PC-E is no exception. We've got about 1% barrel distortion on the FX frame, and it increases a slight bit at minimum focus distance. This is right about my boundary between wanting to correct and not bothering to correct. If you're using this lens in architectural use, you probably will want to correct it. For general landscape use, I don't bother. The distortion seems simple (e.g. no mustache). Compared to the 24mm PC-E, the 19mm PC-E is clearly superior. Not only do you have the axis limitations removed, but the 19mm is just sharper than the 24mm as you work out towards the corners. There's no question in my mind that I'd rather have the 19mm in my bag than the 24mm. Indeed, there's little question in my mind that the 19mm f/4 PC-E is my new main landscape lens on the D850 and Z7. Not only can I control the focus plane quickly and easily, but I can also do impromptu panos by doing a quick three image set (shift left, center, shift right; use a plate with markings so you can keep the front of the lens in the same spot for each image). But again, this is a heavy lens and one that you work with on a tripod, so it's not the backcountry lens some might want. To their credit, Nikon fixed the issues we've all complained about with their PC-E's (axis independence, for example), and then stuck in optics that are even better than before. The result, unfortunately, is a lens that costs a pretty penny, but I doubt that you'll be disappointed in it.